Your need to divide space might include adding a room, hiding clutter or creating a private nook in your living space. How do you know if you need a traditional shoji screen or shoji screen room dividers? The traditional shoji screen is a window or room divider that consists of translucent paper over a frame of wood. Shoji screens originated in Japan and were created as a sliding wooden frame with a rice paper screen. Residents used shoji screens in their homes as a sliding partition to separate a living room and bedroom or two living areas. sho – means to separate. ji – means a piece (Collins English Dictionary). The popularity of shoji screens made way for folding shoji screen room dividers. Folding shoji screen room dividers are made out of wood framed panels with rice paper, solid wood panels as well as cloth or glass panels. Folding shoji room dividers give privacy and can serve as a decorative piece in a home or business. Adding folding shoji room dividers can provide an alternative to installing a stationary wall or room. 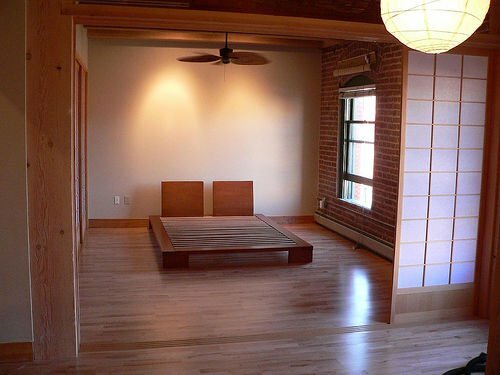 If you need a semi-permanent room divider that can give privacy to a bedroom or living area, a traditional shoji screen is what you need. If you are looking to create a temporary private space, a portable room divider is what you are looking for. Room dividers can be made of solid construction which does not allow light through or out of paper that does allow light to reflect through it. Practical and versatile, room dividers are the perfect way to divide space. Room dividers vary in color and materials. Whether they are semi-permanent or temporary, room dividers are cost effective and easy to change. Take a look at the difference between the shoji screen and our Standard room dividers on our comparison page.